Downtown San Diego’s Waterfront Park opened to momentous acclaim in the summer of 2014. The anticipation was well deserved as the venue has now served as a space for residents to take in the best of life’s simple pleasures for over a year. Here are just a few reasons Downtown San Diego Residents love the new Waterfront Park. The Waterfront Park is home to an abundance of lively events. From the Brew & Food Festival and cultural cuisine expositions to starlit symphonies and the CRSSD music festival, the Civic Greens area of the park brings the community together. 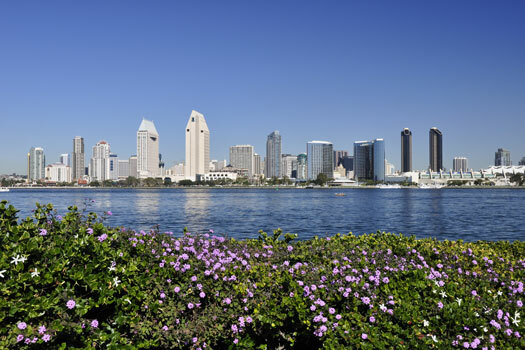 Situated between Little Italy and the San Diego Marina District, the Waterfront Park is a natural oasis in a cosmopolitan setting. The Garden Rooms showcase stunning botanical collections with diverse themes including the unique Mediterranean garden and a calming Diversity Garden. Residents abandon urban stress in these pockets of wilderness. The arts have long thrived in Downtown San Diego, and they are now more accessible than ever thanks to the Waterfront Park. Renowned modern artist Niki de Saint Phalle’s public sculptures enliven the view while painters can be seen capturing the skyline at twilight. From downward dog to cobra, Downtown residents adore honing their yoga practice at the numerous group yoga sessions held year-round, including the ever-popular One Love Movement Charity Yoga Event. Perhaps the most joyous use of the Waterfront Park’s beautiful vistas is as a setting for weddings. Whether reserving the Garden Rooms or the lush Civic Greens, couples can join together with ample space for all of their loved ones to attend. If you’re interested in learning more about the area or are thinking of buying a condo, loft, or penthouse in Downtown San Diego, call 92101 Urban Living at (619) 649-0368 and see what’s available in your desired neighborhood!